If you are like me, the "cabin fever" has been setting in pretty badly lately. Since my last post we have been blasted by two different blizzards here in central PA, and sure enough, as I am typing this post the snow is beginning to fly again. 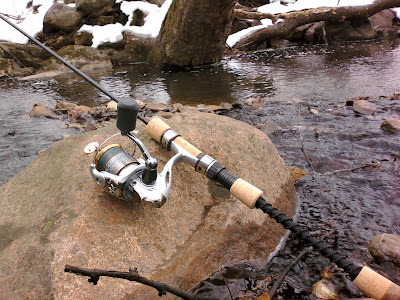 Battling the icy-cold temps and snow-covered ground has made for some tough fishing the past few weeks. In fact, for me it has meant no fishing at all...that is, until the past couple of days. We actually saw some sunny skies this past week, and boy was it welcome. Finally, the snow began to melt in my backyard, and my short-legged puppy dog could actually find a nice patch of grass to go pee pee, lol. Lucky for me, I found a couple opportunities to get out and do some fishing this past week as well. 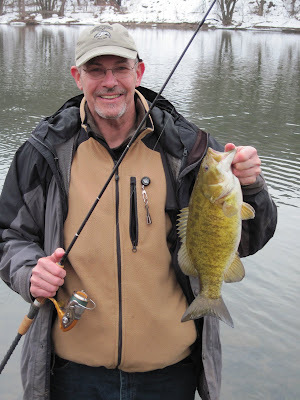 This past Monday morning Dad and I both had off of work, so we decided to hit the river hoping that the recent warming trend had wo ken up a few of our local smallmouth. We fished pretty hard, and hit quite a few spots... in the end, we each ended up with one smallmouth a piece. Not great, but good enough to avoid the skunk. 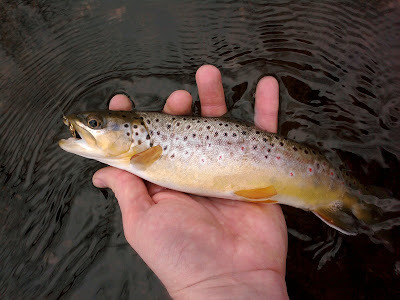 Later on Tuesday afternoon, I was able to sneak away for a couple of hours to visit a section of local trout stream that I have not visited for a few years. It was fun to go back and reacquaint myself with some of my favorite old fishing holes and to revisit some fond memories from my youth. 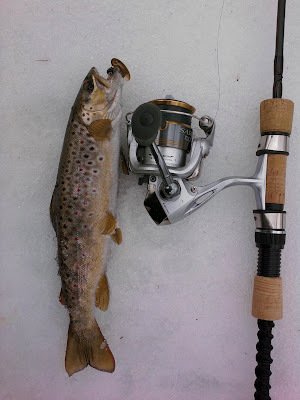 I also took along a new ultra-light spinning outfit that I just built, and it was my pleasure to christen it on a few feisty, stream-bred brown trout. Overall, it has been a slow couple of weeks on the fishing front... but this past week's warm up got the blood flowing again. Let's hope that our most recent snowfall does not amount to much, and the grass will be peaking through before we know it. One thing is for sure, the days are growing longer and springtime will be here before we know it. But until then, good luck staying warm and who knows maybe I'll see you on the water!